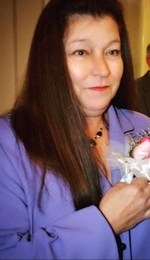 Wendolyn Worth “Wendy” Vaughan, age 59 of Brodnax, died Monday, November 12, 2018. She is survived by her children, Stephanie B Harris (Jeffrey) of Brodnax, Kelly Hood of Charlotte, NC, Michaele T. Spence of Nottoway and Thomas Ross Overton (Hayley) of Farmville. Other surviving family members include her sister, Sharon Vaughan of South Hill, Dawn Moody of Kenbridge and Timmy Moody (Lori) of South Hill, eight grandchildren and a very special caregiver, Ed Pelligrino. Wendy was preceded in death by William R. “Billy” Vaughan, Eulia Clyde Vaughan and Dikey Moody. A Celebration of Life service will be conducted at 4pm on Friday, November 16 at Farrar Funeral Chapel where the family will receive friends one hour prior to the service. Memorial considerations are requested to be made in her memory to Mecklenburg County Cancer Assoc. P.O. Box 311 Chase City, VA. 23924. Online condolences may be placed at www.farrarfuneralhome.net. Farrar Funeral Home of South Hill is serving the Vaughan family.